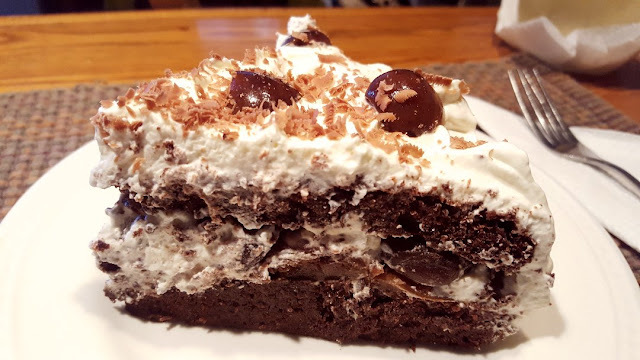 It was very good, but we like fluffy cakes better than dense ones - and this recipe made a dense cake! Next time I'll try something different. There is only half the cake left and I made it last night! For dinner I made my very first Frittata. I followed a recipe very loosely for the number of eggs needed and the cooking time, but kind of winged it beyond that. It turned out light and delicious and there will be more frittatas in our future that's for sure! And the Cheddar is coming along! I'm at the coating stage where I brush it with 3 coats of "cheese coating" which acts to protect the cheese from too much moisture during the aging process. 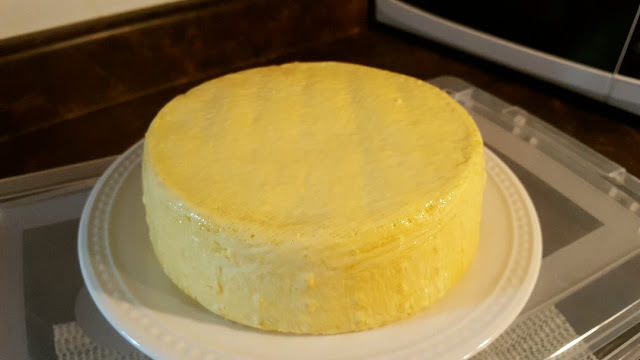 I wrote a more detailed post on Rainy Day Cheese Making about coating and the attempt to make my own cheese cave. The cheese making process, at least the Cheddar, has proven to be much more complicated than I thought it would be. But it is quite a learning experience and I intend to keep learning and keep making lots of cheese! Bell Canada is here rewiring our internet lines that were damaged by squirrels...those silly creatures, wires can't taste all that good. But soon our internet will be as quick as a flash! I'm stuck in the bedroom babysitting the dogs and cats while Alex does all the techie stuff with the Bell techie. It's a forced rest for me because I'd much prefer to be in the kitchen watching cheese coating dry lol! Looks good, I think I would eat too much if you cooked for me! Rain, your frittata looks great. Glad you tried it. You can pretty much put anything in them. I load ours with greens and veggies. The cheese looks good too. I have discovered i can't make a 9 x 13 cake here anymore. We are unable to consume it all, ha ha! I have to cut those recipes in have now too. The cake looks delicious. 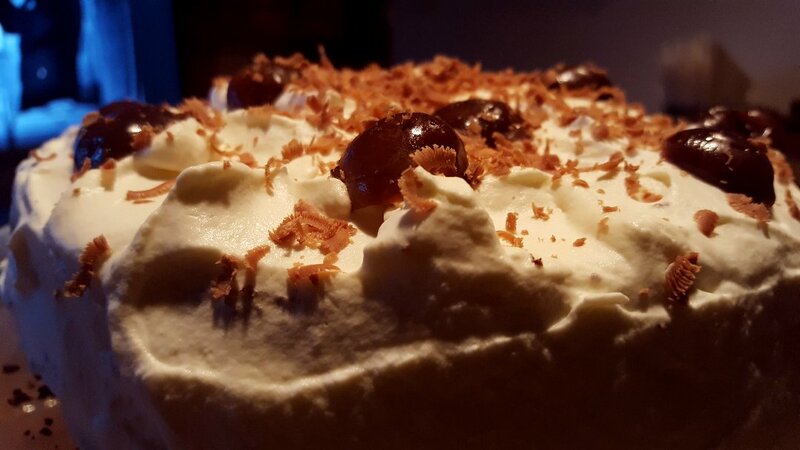 The Black Forest cake 🎂 looks great and.I'm sure it tasted as good as it looks. Wow! That cake looks delish! I would want the brandied cherries though before I make it. I'll have to revisit that post! I commented on your cheese making on your cheese blog. Iw as wondering though if your 'mold' had holes in the bottom to drain it? You kept putting it back in the mold with the weights but then on top of a broiler pan? I got a little confused...not unusual for me! LOL! 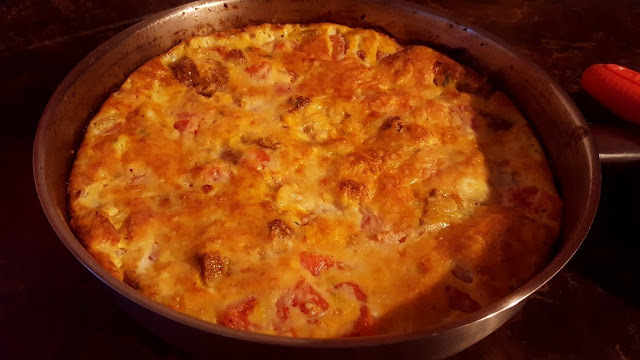 I made my first fritata about a month ago too....they're great...why had I not ever made one before is beyond me! You're too funny with wanting to watch your cheese coating! LOL! Love your passion about everything you do! Have a great weekend...all of you! As Sam I Am above said, you do have a lot of passion for life in all things you do. That's so admirable and I appreciate your sharing all of it here on your blog. The cake looks mah-velous and I'm sure tasted the same. i can't wait for the cheese to be ready! your cake looks delicious..if i liked cake! but my husband sure would love it! btw...did you see my tian recipe? i thought it might be something you might like to make!? A good Black Forest cake is delicious. It looks very good. So much good eating at your place! I haven't had black forest cake for ages. And certainly not homemade. I'd love to be able to reach into the screen with my BIG fork and take a bite of that cake. Thanks for sharing that frittata recipe! I am definitely going to make that. So easy and such simple ingredients. Love it! What I love most about you my dear friend is your vibrant love and enthusiasm for everything you do! It is Great that your passion for cheese making infuses in me to do something with same devotion and for me it is gardening and writing and reading for which I will have to wait until kids don't need as much as they do now. This cake looks just marvelous!!! Coating created magic here and final look is awesome. Your cheese making is so interesting. I love cheese as do my girls. We used to go to a local market in SF and chat w/the cheese lady, as we had called her. She'd let us taste cheese before giving us suggestions on what to get. I will have to give The Outsiders movie a go. I don't eat too much lobster; I've never cooked it at all either. There's not much meat except for the tail. I love crab more and I know how to cook that as my mum had taught me. I'd like to order a black forest cake please lol! Look delicious as does the frittata! Why did I stop here? 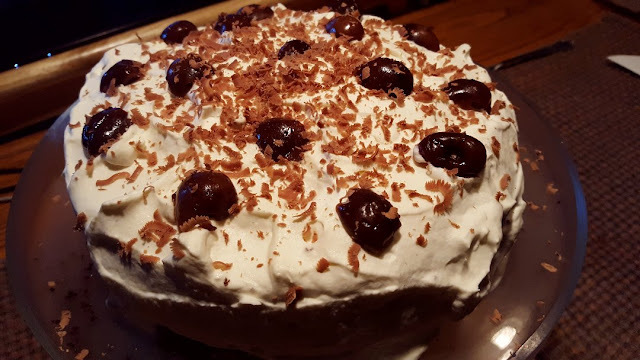 I try to eat healthy and now I crave a black forest cake! I love them. Hi Terry :) It was definitely good! A rare treat though, so much whipped cream!!! Our digestions can handle good amounts of dairy, but they grumble at too much full cream products! Hi Sam :)) You know, that cheese post...I wrote and re-wrote it because I was confusing myself lol...it's easy for me to read something I wrote and understand it because I experienced it, but making it understandable for someone else reading it is a challenge! I wrote a post about it on the cheese making blog, I hope that clears it all up! And I know what you mean...why haven't I ever made a frittata before??? I was the same with quiche...why haven't I done it already? Now we have some great dishes that are easy on the wallet...eggs aren't too pricey here compared to meat and fish. Oh lol...I wanted to watch that cheese coating dry!!! I would have sat there the whole 12 hours if I could lol...this Cheddar is like my baby right now, I need to coddle it! I hope you have a great weekend too! Thanks TB :) Have you started your cheese making again? What do you make? Hi Stefanie :) You're lucky, I never had a cheese lady! I guess I'm my own cheese lady now lol...I'm glad you like the cheesy posts. I'm finding it really interesting learning about everything too. Just remember the Outsiders is based on the book, but it was made for teeny-boppers in the 80's, which is why I LOVED it lol...I personally cannot cook a lobster at home. Can't do it. I know there are "humane" ways, freezing them so they "fall asleep" before the pot...but its just not in me. And you're right about the meat though I love the claw meat, it's so tender! Hi Guillaume :) I love that cake too! I made a scaled-down version, it's normally at least three layers...that would have been so good! I hear rodents are a problem this year. I have muskrats in my ponds making their presence known and chipmunks eating flowers. Hi Tammie Lee :) We don't have too many problems usually but this year the squirrels have gone squirrely...the wires for their snacks were one thing, but they were also trying to build nests in the rafters! We made quick work of fixing any hole we found. Hi Nancy :)) That's funny...no calorie! For me no calorie = no taste!! :) Alex and I only really eat one meal a day and just kind of graze a little in the mornings, I think that's our secret! Frittata is my go to when I don't know what to make for supper. Or omelettes. I am not a big egg fan but if I can fill it with enough stuff (cheese) and slop tons of brown sauce on it then I can swallow it down. A bad experience once with a farm egg left me a little hesitant to eat eggs.....I will spare you the nasty details! Hi Dianna :)) I remember you telling me that you had an "experience"...I can imagine. I don't think I'd eat an egg ever again! Too bad your family doesn't like cake so much, but I guess that saves you some calories lol!